France, Hotels, Photos, Restaurants - let's eat chic, Travel - bon voyage!, Vive la France! Recently I’ve been spending a lot of time organising my photo stock. It’s one task I find addictive, taking me back in time to great meals, interesting trips, quality time spent with my favourite folk, watching my daughter’s development, trying to capture those moments when the simple beauty in nature leaves me (and my lens) glassy-eyed. So I thought it might be time to share some of these images – one a week, on Friday: the Friday Photo. 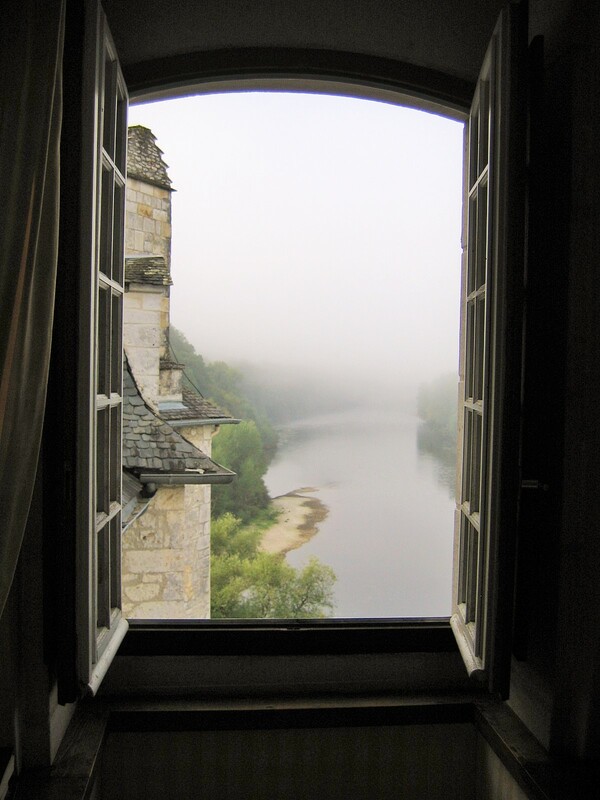 This is the view from our room in the turret at the Château de la Treyne, a hotel overlooking the Dordogne. We’ve stayed there twice now, the first time when we became engaged. The castle is a family-run affair, fashioned from creamy stone and giving directly onto the Dordogne. Imagine throwing open the window each morning to this misty view. Magic. No wonder I said yes.